If you want to get a sense of what’s been lost as chain restaurants replaced independent diners over the last few decades, look for places like Detz Cafe and talk to people like owner Verna Summers. Summers opened Detz back in 1991. “I was working at a restaurant out on North Nevada, and it wasn’t working out. I decided I could either find a job or make one for myself,” she recalls. She opened her first location near the courthouse, moving once over the next 20 years but choosing to stay downtown. She appears to have succeeded at what she set out to do: fans describe her cafe as “perfect American comfort food” and “the best affordable downtown diner. Others refer to it fondly as their “secret diner destination.” Summers, however, is ready to be a little more bold about what she has to offer. In recent months, she added a colorful Want Real Meat/Callicrate Beef banner to the unassuming sign that looms over her modest earth-toned building. “I like local,” she says. Callicrate Beef items on her menu include homestyle burgers (she recommends the house-made guacamole and bacon or the mushroom and Swiss) along with meatloaf, stuffed peppers, Salisbury steak, the hot beef sandwich with mashed potatoes smothered in gravy and the classic French dip. The bones are used to make beef broth for soups. The exceptionally tender New York strip steak is served several ways. In addition, the diner is also known for its pork green chili, homestyle pancakes and a made-from-scratch carrot cake, although Summers also notes “more people are asking for fruit instead of hashbrowns with their eggs these days.” Still comfort food, but on the lighter side. Full menus are available on the restaurant’s website at detzcafe.com. 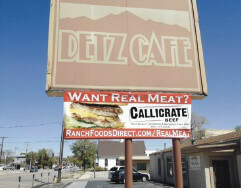 Look for the colorful Callicrate Beef banner at Ranch Foods Direct partner restaurants all over town.